Since joining Kush Marketplace as a hemp consultant, I’ve been talking to CBD hemp farmers all over the United States and I can tell you that the overwhelming majority do not have a solid plan laid out to get their crop to market. Most farmers have very little internet presence and very little time, especially now approaching harvest, to manage all the details of marketing their brand. The ones that have marketing in place at this point are ahead of the curve. At Kush Marketplace we offer a platform that builds an internet presence and brand equity. We offer the farmer a way to build credibility in the eyes of thousands of processors and potential buyers. Posting their crop for sale, a process that can take 10 minutes, puts their product and their brand on display to the world, and believe me, based on some of the meetings I’ve been having, the world is watching! Consider selling a portion of your products via a future contract as a way to hedge against price fluctuations and guarantee revenue streams. We are expecting to see a 5x production in biomass this year alone. I’ve been telling all our farmers to get their crops on the platform now. Don’t wait until harvest time when the market’s flooded and everyone’s running around like a chicken with their head cut off trying to navigate fluctuating market prices. Hedge your bets and avoid the chaos of harvest market fluctuations by pre-selling your crop on our platform. I am definitely seeing it happen right now, in real time. Negotiations for crop futures have begun. Typically, the contracts are one of two things – either a guarantee to buy crops with a 10-15% deposit or a split of the final product. Many processors are asking a 65/35 (+/- 10%), which is generally isolate. The farmer gets 65% of the output, there no monetary transaction in this case. In any case, don’t wait one second longer to get your crop on our site and consider offering buyers a future contract for a percentage of your crop. CBD processors have not scaled at the same rate of growth as farms have so we expect a bottleneck come harvest time. There are simply not enough processors to handle the amount of biomass produced in 2018. 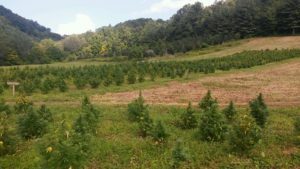 I have talked to a few farmers who do both aspects of the business – they are farmers who have purchased processing equipment, or processors who have started a hemp farm to supply their operation. I believe we’ll see more of these all in one processor/farmer operations as the CBD processors struggle to scale. These all-in-one operations have the benefit of being self-sustaining and actually give back to the marketplace as they source biomass from other farmers to meet production demand and sell their CBD products on the market. Business at Kush Marketplace is booming and, as all eyes turn more and more to our platform on the world stage, our site is becoming a powerful marketing tool for farmers and CBD processors. It is crucial for our hemp farmers to get their crops on our platform early and consider pre-selling by making future contracts on their crop. If you’re one of our hemp farmers, congratulations on your hard work and we look forward to guiding your brand to success. Happy harvest!!! Is There a Hemp Shortage?